Hello, everybody! Hello, Fort Bragg! All the way! Now, I'm sure you realise why I don't like following Michelle Obama. She's pretty good. And it is true, I am a little biased, but let me just say it: Michelle, you are a remarkable First Lady. You are a great advocate for military families. And you're cute. I'm just saying, gentlemen, that's your goal: to marry up. Punch above your weight. Fort Bragg, we're here to mark a historic moment in the life of our country and our military. For nearly nine years our nation has been at war in Iraq. And you - the incredible men and women of Fort Bragg - have been there every step of the way, serving with honour, sacrificing greatly, from the first waves of the invasion to some of the last troops to come home. So, as your commander-in-chief and on behalf of a grateful nation, I'm proud to finally say these two words, and I know your families agree: Welcome home! Welcome home. Welcome home. Welcome home. It is great to be here at Fort Bragg, home of the Airborne and Special Operations Forces. I want to thank General Anderson and all your outstanding leaders for welcoming us here today, including General Dave Rodriguez, General John Mulholland. And I want to give a shout-out to your outstanding senior enlisted leaders, including Command Sergeant Major Roger Howard, Darrin Bohn, Parry Baer. And give a big round of applause to the Ground Forces Band. We've got a lot of folks in the house today. We've got the 18th Airborne Corps - the Sky Dragons. We've got the legendary All-American 82nd Airborne Division. We've got America's quiet professionals - our Special Operations Forces. From Pope Field, we've got Air Force. And I do believe we've got some Navy and Marine Corps here, too. And, though they're not here with us today, we send our thoughts and prayers to General Helmick, Sergeant Major Rice and all the folks from the 18th Airborne and Bragg who are bringing our troops back from Iraq. We honour everyone from the 82nd Airborne and Bragg serving and succeeding in Afghanistan, and General Votel and those serving around the world. And let me just say, one of the most humbling moments I've had as president was when I presented our nation's highest military decoration, the Medal of Honor, to the parents of one of those patriots from Fort Bragg who gave his life in Afghanistan - Staff Sergeant Robert Miller. I want to salute Ginny Rodriguez, Miriam Mulholland, Linda Anderson, Melissa Helmick, Michelle Votel and all the inspiring military families here today. We honour your service as well. And finally I want to acknowledge your neighbours and friends who help keep this outstanding operation going - all who help to keep you Army Strong, and that includes Representatives Mike McIntyre, and Dave Price, and Heath Shuler, and Governor Bev Perdue. I know Bev is so proud to have done so much for our military families. So give them a big round of applause. Today, I've come to speak to you about the end of the war in Iraq. Over the last few months the final work of leaving Iraq has been done. Dozens of bases with American names that housed thousands of American troops have been closed down or turned over to the Iraqis. Thousands of tons of equipment have been packed up and shipped out. Tomorrow, the colours of United States Forces-Iraq - the colours you fought under - will be formally cased in a ceremony in Baghdad. Then they'll begin their journey across an ocean, back home. Over the last three years, nearly 150,000 US. troops have left Iraq. And over the next few days a small group of American soldiers will begin the final march out of that country. Some of them are on their way back to Fort Bragg. As General Helmick said, "They know that the last tactical road march out of Iraq will be a symbol and they're going to be a part of history." As your commander-in-chief I can tell you that it will indeed be a part of history. Those last American troops will move south on desert sands and then they will cross the border out of Iraq with their heads held high. One of the most extraordinary chapters in the history of the American military will come to an end. Iraqis future will be in the hands of its people. America's war in Iraq will be over. Now, we knew this day would come. We've known it for some time. But still, there is something profound about the end of a war that has lasted so long. Now, nine years ago, American troops were preparing to deploy to the Persian Gulf and the possibility that they would be sent to war. Many of you were in grade school. I was a state senator. Many of the leaders now governing Iraq - including the Prime Minister - were living in exile. And since then our efforts in Iraq have taken many twists and turns. It was a source of great controversy here at home, with patriots on both sides of the debate. But there was one constant - there was one constant - your patriotism, your commitment to fulfil your mission, your abiding commitment to one another. That was constant. That did not change. That did not waiver. It's harder to end a war than begin one. Indeed, everything that American troops have done in Iraq - all the fighting and all the dying, the bleeding and the building, and the training and the partnering - all of it has led to this moment of success. Now, Iraq is not a perfect place. It has many challenges ahead. But we're leaving behind a sovereign, stable and self-reliant Iraq, with a representative government that was elected by its people. We're building a new partnership between our nations. And we are ending a war not with a final battle, but with a final march toward home. This is an extraordinary achievement, nearly nine years in the making. And today we remember everything that you did to make it possible. We remember the early days: the American units that streaked across the sands and skies of Iraq, the battles from Karbala to Baghdad, American troops breaking the back of a brutal dictator in less than a month. We remember the grind of the insurgency: the roadside bombs, the sniper fire, the suicide attacks. From the "triangle of death" to the fight for Ramadi, from Mosul in the north to Basra in the south, your will proved stronger than the terror of those who tried to break it. We remember the spectre of sectarian violence. Al-Qaeda's attacks on mosques and pilgrims, militias that carried out campaigns of intimidation and campaigns of assassination. And in the face of ancient divisions you stood firm to help those Iraqis who put their faith in the future. We remember the surge and we remember the Awakening when the abyss of chaos turned toward the promise of reconciliation. By battling and building block by block in Baghdad, by bringing tribes into the fold and partnering with the Iraqi army and police, you helped turn the tide toward peace. And we remember the end of our combat mission and the emergence of a new dawn, the precision of our efforts against al-Qaeda in Iraq, the professionalism of the training of Iraqi security forces, and the steady draw down of our forces. In handing over responsibility to the Iraqis, you preserved the gains of the last four years and made this day possible. Just last month some of you - members of the Falcon Brigade - turned over the Anbar Operations Center to the Iraqis in the type of ceremony that has become commonplace over these last several months. In an area that was once the heart of the insurgency, a combination of fighting and training, politics and partnership brought the promise of peace. And here's what the local Iraqi deputy governor said: "This is all because of the US. forces' hard work and sacrifice." That's in the words of an Iraqi. Hard work and sacrifice. Those words only begin to describe the costs of this war and the courage of the men and women who fought it. We know too well the heavy cost of this war. More than 1.5 million Americans have served in Iraq - 1.5 million. Over 30,000 Americans have been wounded and those are only the wounds that show. Nearly 4,500 Americans made the ultimate sacrifice - including 202 fallen heroes from here at Fort Bragg - 202. So today, we pause to say a prayer for all those families who have lost their loved ones, for they are part of our broader American family. We grieve with them. We also know that these numbers don't tell the full story of the Iraq war - not even close. Our civilians have represented our country with skill and bravery. Our troops have served tour after tour of duty with precious little dwell time in between. Our Guard and Reserve units stepped up with unprecedented service. You've endured dangerous foot patrols and you've endured the pain of seeing your friends and comrades fall. You've had to be more than soldiers, sailors, airmen, Marines and Coast Guardsmen - you've also had to be diplomats and development workers and trainers and peacemakers. Through all this, you have shown why the United States military is the finest fighting force in the history of the world. 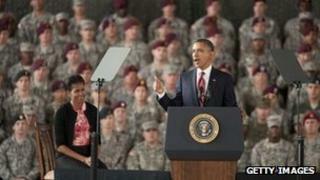 As Michelle mentioned, we also know that the burden of war is borne by your families. In countless base communities like Bragg, folks have come together in the absence of a loved one. As the Mayor of Fayetteville put it: "War is not a political word here. War is where our friends and neighbours go." So there have been missed birthday parties and graduations. There are bills to pay and jobs that have to be juggled while picking up the kids. For every soldier that goes on patrol there are the husbands and the wives, the mothers, the fathers, the sons, the daughters praying that they come back. So today, as we mark the end of the war, let us acknowledge, let us give a heartfelt round of applause for every military family that has carried that load over the last nine years. You too have the thanks of a grateful nation. Part of ending a war responsibly is standing by those who fought it. It's not enough to honour you with words. Words are cheap. We must do it with deeds. You stood up for America; America needs to stand up for you. That's why, as your commander-in chief, I am committed to making sure that you get the care and the benefits and the opportunities that you've earned. For those of you who remain in uniform, we will do whatever it takes to ensure the health of our force, including your families. We will keep faith with you. We will help our wounded warriors heal and we will stand by those who've suffered the unseen wounds of war. And make no mistake, as we go forward as a nation we are going to keep America's armed forces the strongest fighting force the world has ever seen. That will not stop. But our commitment doesn't end when you take off the uniform. You're the finest that our nation has to offer. And after years of rebuilding Iraq, we want to enlist our veterans in the work of rebuilding America. That's why we're committed to doing everything we can to extend more opportunities to those who have served. That includes the Post-9/11 GI Bill, so that you and your families can get the education that allows you to live out your dreams. That includes a national effort to put our veterans to work. We've worked with Congress to pass a tax credit so that companies have the incentive to hire vets. And Michelle has worked with the private sector to get commitments to create 100,000 jobs for those who've served. And by the way, we're doing this not just because it's the right thing to do by you. We're doing it because it's the right thing to do for America. Folks like my grandfather came back from World War II to form the backbone of this country's middle class. For our post-9/11 veterans with your skill, with your discipline, with your leadership, I am confident that the story of your service to America is just beginning. But there's something else that we owe you. As Americans, we have a responsibility to learn from your service. I'm thinking of an example - Lieutenant Alvin Shell, who was based here at Fort Bragg. A few years ago, on a supply route outside Baghdad, he and his team were engulfed by flames from an RPG attack. Covered with gasoline, he ran into the fire to help his fellow soldiers, and then led them two miles back to Camp Victory where he finally collapsed, covered with burns. When they told him he was a hero, Alvin disagreed. "I'm not a hero," he said. "A hero is a sandwich. I'm a paratrooper." Policymakers and historians will continue to analyze the strategic lessons of Iraq - that's important to do. Our commanders will incorporate the hard-won lessons into future military campaigns - that's important to do. But the most important lesson that we can take from you is not about military strategy - it's a lesson about our national character. For all of the challenges that our nation faces, you remind us that there's nothing we Americans can't do when we stick together. For all the disagreements that we face you remind us there's something bigger than our differences, something that makes us one nation and one people regardless of colour, regardless of creed, regardless of what part of the country we come from, regardless of what backgrounds we come out of. You remind us we're one nation. And that's why the United States military is the most respected institution in our land because you never forget that. You can't afford to forget it. If you forget it, somebody dies. If you forget it, a mission fails. So you don't forget it. You have each other's backs. That's why you, the 9/11 Generation, have earned your place in history. Because of you, because you sacrificed so much for a people that you had never met, Iraqis have a chance to forge their own destiny. That's part of what makes us special as Americans. Unlike the old empires, we don't make these sacrifices for territory or for resources. We do it because it's right. There can be no fuller expression of America's support for self-determination than our leaving Iraq to its people. That says something about who we are. Because of you, in Afghanistan we've broken the momentum of the Taliban. Because of you, we've begun a transition to the Afghans that will allow us to bring our troops home from there. And around the globe, as we draw down in Iraq, we have gone after al-Qaeda so that terrorists who threaten America will have no safe haven and Osama bin Laden will never again walk the face of this Earth. So here's what I want you to know and here's what I want all our men and women in uniform to know: because of you we are ending these wars in a way that will make America stronger and the world more secure. Because of you. That success was never guaranteed. And let us never forget the source of American leadership: our commitment to the values that are written into our founding documents and a unique willingness among nations to pay a great price for the progress of human freedom and dignity. The war in Iraq will soon belong to history. Your service belongs to the ages. Never forget that you are part of an unbroken line of heroes spanning two centuries - from the colonists who overthrew an empire, to your grandparents and parents who faced down fascism and communism, to you - men and women who fought for the same principles in Fallujah and Kandahar and delivered justice to those who attacked us on 9/11. Looking back on the war that saved our union, a great American, Oliver Wendell Holmes, once paid tribute to those who served. "In our youth," he said, "Our hearts were touched with fire. It was given to us to learn at the outset that life is a profound and passionate thing." All of you here today have lived through the fires of war. You will be remembered for it. You will be honoured for it, always. You have done something profound with your lives. When this nation went to war, you signed up to serve. When times were tough, you kept fighting. When there was no end in sight, you found light in the darkness. And years from now your legacy will endure in the names of your fallen comrades etched on headstones at Arlington and the quiet memorials across our country; in the whispered words of admiration as you march in parades and in the freedom of our children and our grandchildren. And in the quiet of night you will recall that your heart was once touched by fire. You will know that you answered when your country called, you served a cause greater than yourselves, you helped forge a just and lasting peace with Iraq and among all nations. God bless you all, God bless your families, and God bless the United States of America.